Modality-specific working memory (WM) training effects (auditory training group versus both other groups; AG – TG&CG) in beta-band (17.5–22.5 Hz) connectivity (imaginary coherency) between regions of interest (ROIs) and all other electrodes. Each ROI comprises eight adjacent electrodes, bilaterally. Topographical distribution of the specific ROI is depicted left to the corresponding connectivity topo map. Connectivity differences are displayed as z-scores (connectivity differences divided by the SD of the permutations). (A, B) Modality-specific training effects between the frontal ROI (top, left), parietal ROI (top, right), central ROI (bottom, left), and occipital ROI (bottom, right), and all other electrodes are shown separately for the blind (A) and the sighted (B). Asterisks indicate between which electrodes and the corresponding ROI modality-specific training effects were significant. (C) Additionally, for all ROIs with significant effects, bar plots depict mean pre-post changes in connectivity, pooled across all significant electrodes, which are highlighted in A. Bar plots are shown separately for three blind groups (auditory WM training group, AG; tactile WM training group, TG; control group, CG). Error bars in bar plots represent the standard error of the mean. Asterisks indicate significant changes in pre-post connectivity. Note, no significant connectivity differences were observed in the sighted at any ROI. Yet, to visualize group differences in the sighted (B), electrodes with the highest z-values and the corresponding RIO were selected, i.e. electrodes with the highest training-induced changes. The number of selected electrodes per ROI was adjusted to the number of significant electrodes in the blind. (D) Bar plots depict mean changes in pre-post connectivity between these electrodes and the corresponding ROI. 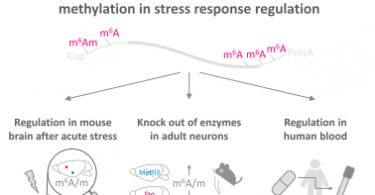 The functional relevance of crossmodal activation (e.g. auditory activation of occipital brain regions) in congenitally blind individuals is still not fully understood. The present study tested whether the occipital cortex of blind individuals is integrated into a challenged functional network. A working memory (WM) training over four sessions was implemented. Congenitally blind and matched sighted participants were adaptively trained with an n-back task employing either voices (auditory training) or tactile stimuli (tactile training). In addition, a minimally demanding 1-back task served as an active control condition. Power and functional connectivity of EEG activity evolving during the maintenance period of an auditory 2-back task were analyzed, run prior to and after the WM training. Modality-specific (following auditory training) and modality-independent WM training effects (following both auditory and tactile training) were assessed. 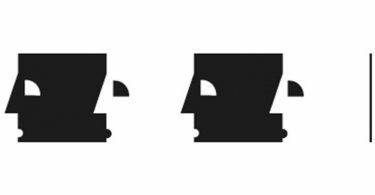 Improvements in auditory WM were observed in all groups, and blind and sighted individuals did not differ in training gains. Auditory and tactile training of sighted participants led, relative to the active control group, to an increase in fronto-parietal theta-band power, suggesting a training-induced strengthening of the existing modality-independent WM network. No power effects were observed in the blind. 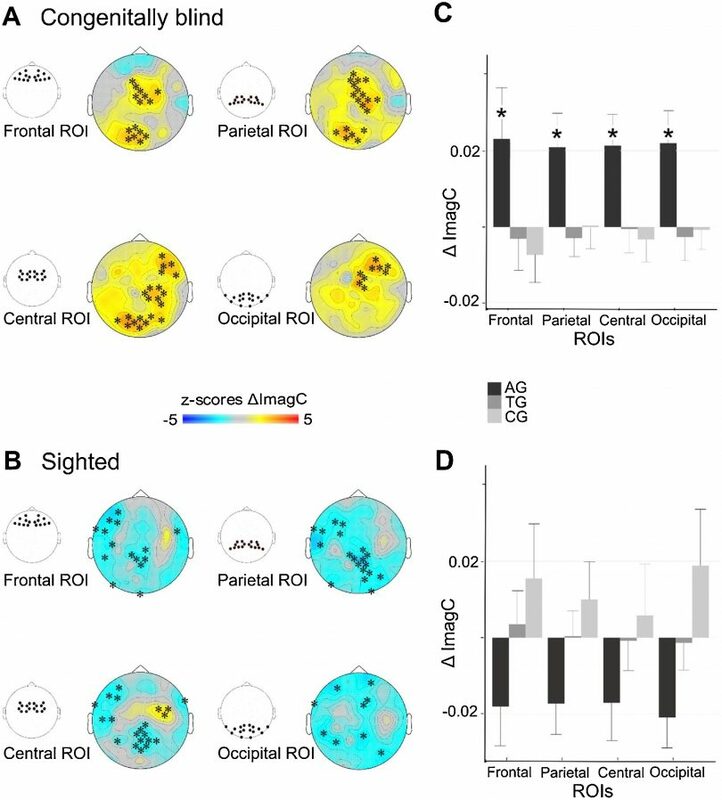 Rather, after auditory training the blind showed a decrease in theta-band connectivity between central, parietal, and occipital electrodes compared to the blind tactile training and active control groups. Furthermore, in the blind auditory training increased beta-band connectivity between fronto-parietal, central and occipital electrodes. In the congenitally blind, these findings suggest a stronger integration of occipital areas into the auditory WM network. Gudi-Mindermann, H., Rimmele, J.M., Nolte, G., Bruns, P., Engel, A.K., Röder, B. (2018). Behavioural Brain Research, 348:31-41.